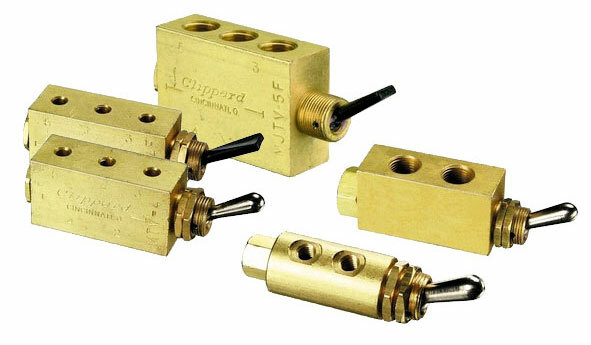 These #10-32 and 1/8" NPT ported 2-way, 3-way and 4-way valves are manually actuated with a toggle. The toggles are electroless nickel plated steel and have a detent action. 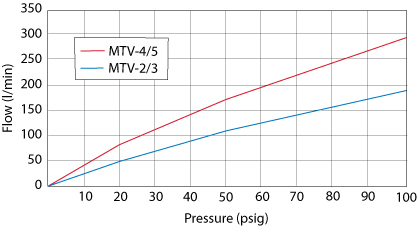 The MTV-5 has threaded exhaust and can be connected in a dual inlet pressure configuration. For high temperature applications (up to 400°F), or othose that require special seals for chemical compatibility, Clippard offers optional FKM seals. MTV-2 and MTV-3 are poppet valves. MTV-4 and MTV-5 are spool valves. MTV-5 valves are fully-ported. Input Pressure: 150 psig max. ; MJTV-3: 300 psig max. MTV-2, MTV-4, MJTV-4: 12 oz. 3-way valves have a supply, outlet and exhaust port. When the toggle is in the "on" position, air flows from the inlet to the outlet and the exhaust port is blocked. Moving the toggle to the "off" position closes the inlet and opens the outlet to the exhaust port which vents the outlet to atmosphere. 4-way valves can supply and exhaust two different outlets, and are commonly used with double-acting cylinders. When the toggle is in one position, air flows from the inlet to one of the outlets. The second outlet is open to the exhaust port which is vented to atmoshere. Moving the toggle to the opposite position opens the inlet to the second outlet while exhausting the first outlet. 4-way fully-ported valves can be plumbed in a dual pressure inlet configuration to save air consumption.